Last week I got so tired of working on my 2012 Designer Mystery BOM, I dropped it and whipped up the May "Vintage Schnibbles" project. The pattern is Gentle Art by Miss Rosie's Quilt Co. and the fabric is a charm pack of The Ladies Stitching Club from Moda. It's the 22nd quilt I've pieced in 2013, on my way to my fourth year of 52 Quilts in 52 Weeks. On Memorial Day, I took a notion to finish a red-white-and-blue quilt for a Sailor on The Younger Son's ship, the USS George Washington. She passed the test for her Navy Warfare Qualification, kind of a big deal in the Navy. I blogged this one in process. The pattern is "Stars from Stripes" by Cozy Quilts, and the fabric is all from my RWB strip bin. Congratulations, Sailor! 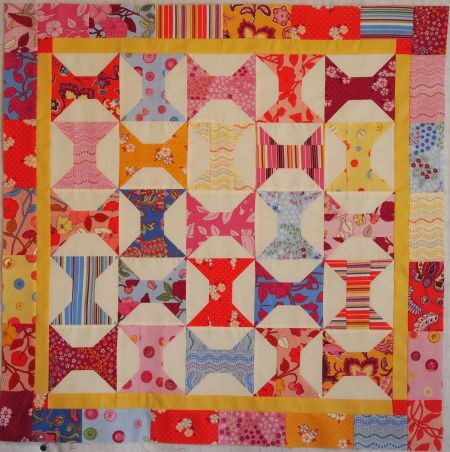 Tomorrow's Fat Quarter Fun class at Ruth's Stitchery has been cancelled. Instead, I will work on the last FQF quilt I started. It's called "Currents," designed by Sharon Winter for Brookshier Design Studio..
Can you believe that design is made with just HSTs and solid squares? I'll show you my version on Design Wall Monday. 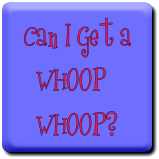 Linking up to Thank Goodness It's Finished Friday, hosted this week by Lucy at Charm About You, Link a Finish Friday by Richard and Tanya, and Can I get a Whoop Whoop by Sarah. Tomorrow is UFO Parade Day -- get those May UFO finishes in before 6pm MDT today to be included. And come back tomorrow to see some wonderful finished UFOs! Your Schnibbles is really lovely and the RWB quilt will make such a nice gift. Love your schnibbles and the RWB is gorgeous and will be a lovely gift. 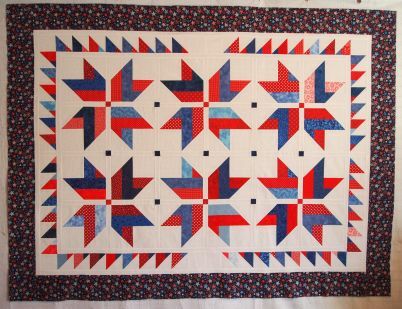 Love your Red, White, and Blue quilt. I always seem to have a heart for those. Have a super day! Thanks, Jennifer. I really started something when I made the first quilt for one of Jacob's shipmates -- there are 5000+ sailors on the GW, so I won't be making one for each, but maybe one for each Mass Communication type! You're such a busy lady! Your machine must get tired!